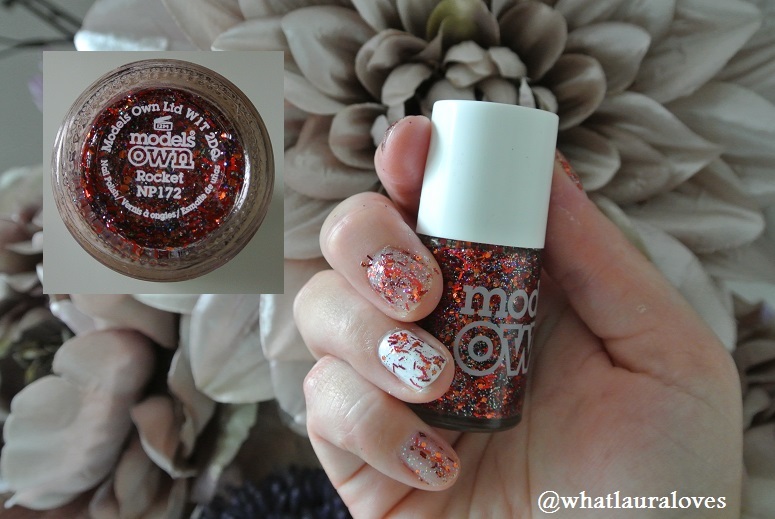 Last month I blogged about Models Own’s first AW13 release, the Velvet Goth Collection and this month I’m blogging about their second release for the autumn winter season, the Fireworks Collection. Fireworks is a brand new collection of five clear polishes packed full of glittery bits and pieces in lots of different shapes and sizes. They can all be worn alone and built up to create a really sparkly nail or layered over another coloured polish as a sparkly top coat. The Fireworks line consists of polishes that have a range of multi faceted fragments within them that the wearer to choose the intensity they want depending on the look they are wanting to achieve from a subtle sparkler to a dazzling rocket. Of the five shades, I am lucky enough to have been gifted three of them. Those that I am missing are Catherine Wheel which is a medium glitter effect polish with four glitters in it including gold strands and red polka dots and the shade Banger which is densely packed full of five different glitters including long blue strands and fuchsia polka dots. The three polishes that I have are Sparkler, Roman Candle and Rocket. Sparkler is the most subtle of the Fireworks range, containing just one type of glitter- silver holographic strands that look absolutely gorgeous when worn as a top coat. This is one of my favourites out of the collection. Rocket is the most intense of all of the Fireworks polishes as it is jam packed full of seven different glitters, including long red strands, a fine black and gold base and orange polka dots that give a glitter covering. It is the polish that reminds me of the 5th November the most as the colours remind me of a bonfire. My favourite polish out of them all is Roman Candle. This is densely packed with a mix of six gorgeous glitters from black and silver strands to fuchsia polka dots. I love it! The polishes don’t apply particularly evenly simply because they’re glitters which adds to their effect- each time you apply these they will look slightly different on your nails. With them having a clear base you can move the glitter around a little to create the look you’re going for. They dry pretty quickly like all Models Own polishes and I find that the best way to remove them is to soak a cotton pad in some nail polish remover and to press it onto the nail with a little tin foil wrapped around. 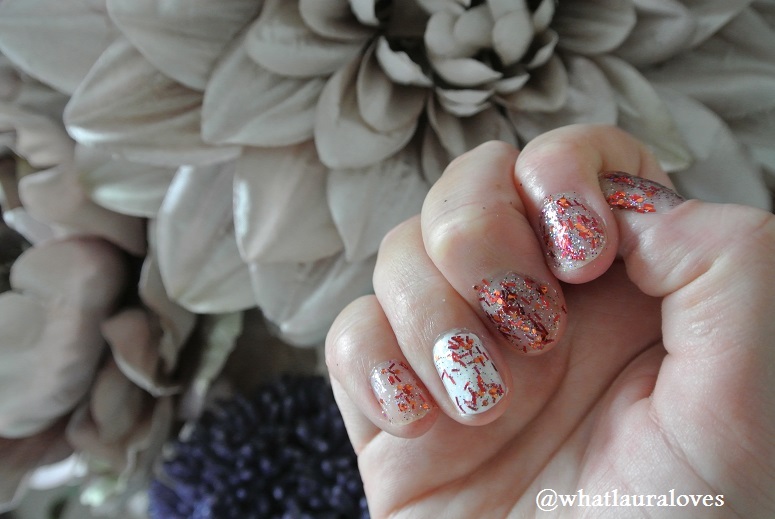 Leave the nails for a few minutes then the glitter wipes away much more easily. I took all of these photos on my bare nails, without using a base or top coat so that you can see a true reflection of the polish and I’ve used two coats on each nail. 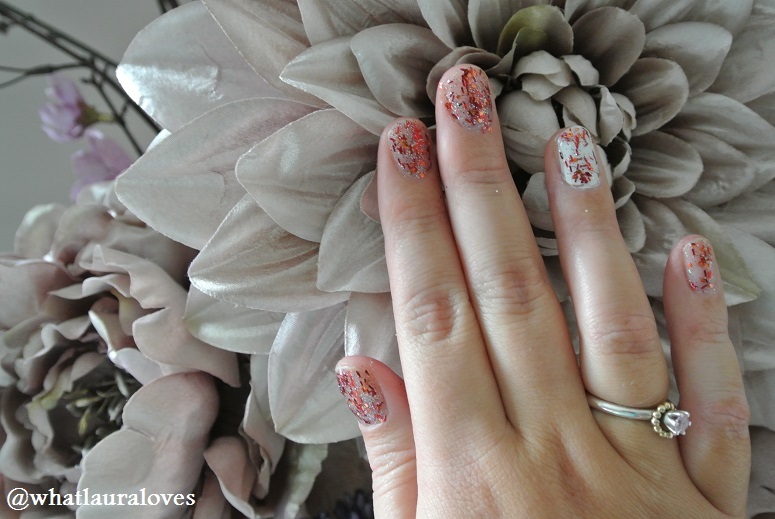 On my ring finger, I have show what the polishes would look like when used as a top coat. The white polish I’ve used is Snow White, also from Models Own. I really like this white polish as after two coats, it is opaque. I think when I wear the Fireworks polishes in future, I would definitely wear them as a top coat as I think it gives a lovely effect on top of another polish and I’m really looking forward to pairing these up with different coloured base polishes. I would also wear a top coat with them as whilst the clear polish feels smooth, there are some slightly more rough areas where the glitter pieces poke through. I really think these look gorgeous, which is your favourite? Each of these little glitter explosion bottles are 14ml in size, like all Models Own polishes and they retail for £5 a piece. They’re available right away from the Models Own website, the Bottleshop and in Boots and from the 25th September, you’ll be able to buy them from Superdrug. Which autumn winter collection is your favourite- Velvet Goth or Fireworks?